Today I wanted to feature a design style that would marry “old-school” with salvage. I fell head over heels for the simplicity of the industrial hairpin leg combined with the earthy textures of reclaimed wood. Let’s look at some inspiring images to get your creative juices flowing! A project by Atlas Wood Co. was recently featured on Houzz. The bench has a “man-tique” meets environmental feel combining knotty wood, heavy metal and (re)imagined coffee bags as upholstery. Megan Toro of Modern Textures in Tulsa, Oklahoma has some fabulous pieces as well. I’m just swooning over the multi-colored, chevron pattern in this coffee table. Configuring all the perfect angles and combinations of wood-tones had to be a labor of love. Most of her wood remarkably is sourced from scraps…kinda make you want to hoard those left-overs for a rainy day, eh? If you’d like to see more of her amazing work, journey over here. She’s pretty talented! Just one more bit of awesomeness (rich with contrasting tone) from this sassy designer. Psst! Megan also does custom wall art too! Shoot her a request here. In the 1940’s folks had to be creative with their limited resources during wartime and metal was scarce. That’s where Henry P. Glass comes into the picture. He invented the hairpin leg out of necessity and it has since evolved into a trademark for mid-century furniture. Jump forward to the present and we see the merit of salvaged wood trending well in the world of design…plus let’s admit…reclaimed wood has that hidden “past-life” story to tell. This Old House has a great tutorial for those of you hankering to try your own hand at crafting something gorgeous with hairpin legs. Here’s a sneak peek. You can order various sizes depending on your project. Envisioning a coffee table? They’ve got 12″. Maybe a new desk for your home office? They’ve got 32″. The cool thing is, their prices are actually less than most sites that mass produce them. Check out their shop if you’re in love with mid-century design and need some awesome, hand-fabricated resources for your next project. One more little tidbit! You know that scrap/reclaimed wood you’ve been saving? It’s thirsty. Really thirsty. So you’ll want to revive it to its original glory with this hydrating love potion from Urban Wood Goods. 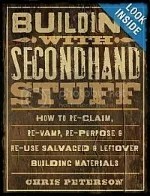 Don’t neglect your salvaged wood after all your hard work! This all-natural beeswax concoction is just what your parched project needs. Take a look at the before and after images. This stuff really brings out the beauty of the wood grain don’t you think? Feels good too! Well my friends, thanks for visiting me today and happy (re)imagining!